Las Vegas’ legendary Sahara Hotel and Casino folded its final hand yesterday, and I was sad to see another era inching closer to its end. The shuttering leaves only the Riviera and Tropicana dating from the 1950s, and the Flamingo from the ‘40s on The Strip. The Saraha was well-known as a Rat Pack hangout, back when being a celebrity posse was more than a publicity stunt. 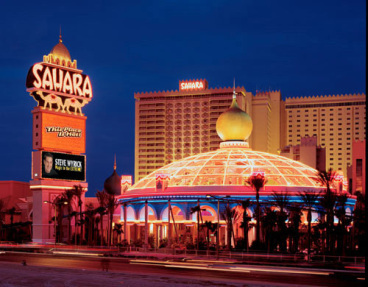 We weren’t exactly heirs to the Rat Pack, but my buddy Nick and I stayed at the Sahara on one our sojourns to Sin City, and I have pleasant memories of the place. It wasn’t the snazziest joint on The Strip, and if Frank Sinatra or Dean Martin were still around, I doubt they’d be caught dead in the place, because it had been allowed to decline in recent years. But for our purposes, the Sahara worked just fine.